Steem Institute: introducing Steem Beginner, your gateway to the Steem Blockchain and community! We are glad to announce Steem Beginner, a Wordpress powered blog and resource site dedicated to the promotion the Steem Blockchain. Our vision is to become the gateway to the Steem community. We want to promote Steem through competitive blogging, offering diverse content including interviews, press releases, opinion, news, analysis, reviews and more. 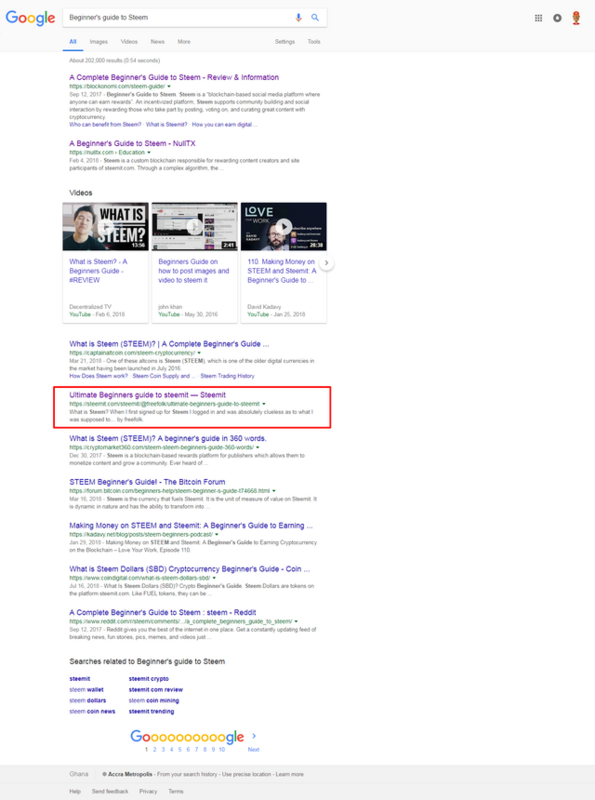 Steem is a social blogging Blockchain, yet if you should Google "Beginner's guide to Steem", interesting you will not find anything from Steemit or Busy. We got just one post. Maybe it's enough, if you visit the user's profile, you will find out that that same post has been blogged three times. One version of it get it labeled by @cheetah as plagiarized content, and manual investigations confirm they all are. Steem deserves better. We can do better. We can give Steem prospects a better way about the Blockchain than having to scavenge articles written by outsiders from blogs or indie authors on Steemit. All the information you get is from general cryptocurrency blogs. We want to change that. We want the Steem community and industry to its own authority site which tells its story. People do not have to go to random sites to learn about Steem from bloggers who are not Steemians. Steem Beginner is built by Steemians for Steemians and prospects. We took care to craft the site beautifully for Steem, so please take time to explore it and give us your feedback. There may be a few places we might get our facts or stats wrong, or even made typos errors. and to access the Steem Press curation service. Developing and maintaining a custom-built site is costly in terms of time, resources and mone. Open sourcing still does not garner the needed maintainers. Whiles hosting in the cloud requires expensive monthly DB setup, server setup and other fees. With WP, these challenges become minimal. Also, we have the Steem Press curation service which might support the work of our authors. We are keeping things small, as all of our projects are bootstrap financed. As evident on the site, we are offering free promotion via listing to several Steem projects and initiatives. Our pages are full of recommendations to Steem apps and services. We will keep it that way for as long as possible. however, if we do receive any partnership or sponsorship offer from any Steem venture, we would offer them preferential exposure. We are actively seeking partners, typically Steem power delegators and those who could give up a >$1 vote a day on just one post. With their support, we will be able to fund the site's expenses as well as support our authors. In return, we would promote the sponsors to our readers and community. Everyone could be our sponsors, from a witness to Steem investor to a bid bot. See our sponsor's page for more information. We would be publishing with Steem Press, hopefully, our posts may benefit from their curation service. We are seeking one project manager to manage the project. If you have a good experience in the WP industry and can testify to it with a blog, please contact. We are also seeking one editor, someone who basically proof-reads all posts by author and is the final publisher. Anyone with good English language skills is welcome. Yes! We need Steemians to fill the platform with content! It could be anyone. Visit our author's program to get started. Join us in the Insitute's Discord server for a chat. Several thanks to @Transisto, @BlockTrades, @Utopian-io, @ReggaeMuffin, @AusbitBank, @pFunk, @Drakos, @Techslut, @TheRealWolf, and many others. Their continued support has brought us this far. Interesting! Maybe you can work together with @steemonboarding? So, you couldn't use Steem for blogging and writing articles? Of course. Not Wordpress. You could submit articles via some API. I explained the reason for choosing WP clearly in the post. Perhaps you missed it. Please refer the heading: "Site build". and to access the Steem Press curation service - not needed if you post directly on Steem. And not forget the fact that you are trying to promote Steem on a completely different platform. That behavior possibly can signal to some potential new users that Steem and its apps is not worth enough to post blogs and articles on it. I was trying to be objective and constructive as much as I can. Nonconstructive would be to say that promoting Steem and writing Steem tutorials on Wordpress is oxymoron. Thanks for your interest. Unfortunately, you are missing the point. You seem to be confusing the clients with the Blockchain. Steem is a headless CMS solution. The clients you mentioned(Steemit, Partiko, ...) are simply software used to publish to Steem, the very same way that WP is also a software used to publish(and supports publishing to Steem, which I did clearly say we would do). So basically there is no difference between posting to Steem from WP or Steemit or Partiko. They are simple software, Steemit doesn't make your posts more "Steem" worthy or whatever, nor does using Partiko make you more "loyal" to the Steem community. These clients are typically blogging interfaces, so you cannot have your own domain, a custom set of pages, support for multiple-authors(except posting on the guest's behalf or using Peer Query's muti-author support for project blogs) or your own brand. You cannot build a universal authority blog on a Steem client, as you would be dependent on clients not designed for that. The closest is the http://engrave.website' project. Perhaps you should visit their site and understand why they build such a solution. Steem clients are custom clients, they have their own limitations. Building a conventional blog gives you more choices, control, and exposure than you can get from relying on your social blog on any Steem client. OK. My bad. I missed that part where you explained that your WP website will run on Steem. Anyway, IMHO that's an overkill. And users would better adopt Steem and understand concept from tutorials and other content posted on native Steem clients. I upvoted your contribution because to my mind your post is at least 13 SBD worth and should receive 151 votes. It's now up to the lovely Steemit community to make this come true.